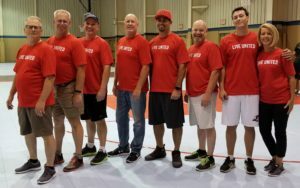 Garber Metrology employees have volunteered before in the United Way’s Day of Caring by helping with clean-up projects or yard work for several service companies supported by United Way. But this year was different, and the most rewarding of the volunteer services we have done. We signed up to be “Football Buddies” for United Disabilities Services Foundation that is committed to helping people with disabilities. Our duties were to be a “Buddy” for those whose disabilities made it difficult to run or catch a football. Everybody got a chance to perform the different functions needed in a football game. Including Kicking Off, Quarterbacking, being a Running Back, Catching a Pass and scoring Touchdowns. We shadowed our Buddies and helped them perform the functions they were unable to do by themselves, but gave them the ball whenever possible so they could experience the different parts of the game. It was a great time and they even had cheerleaders! A couple of hours that were well spent on a Saturday Morning. Lots of smiles, laughter, excitement, cheering and spiking of the football for all that participated, Players and Buddies. We definitely got to make some new friends that day too.